Ouyang, H., Hou, K., Wang, L., and Peng, W. (2017). 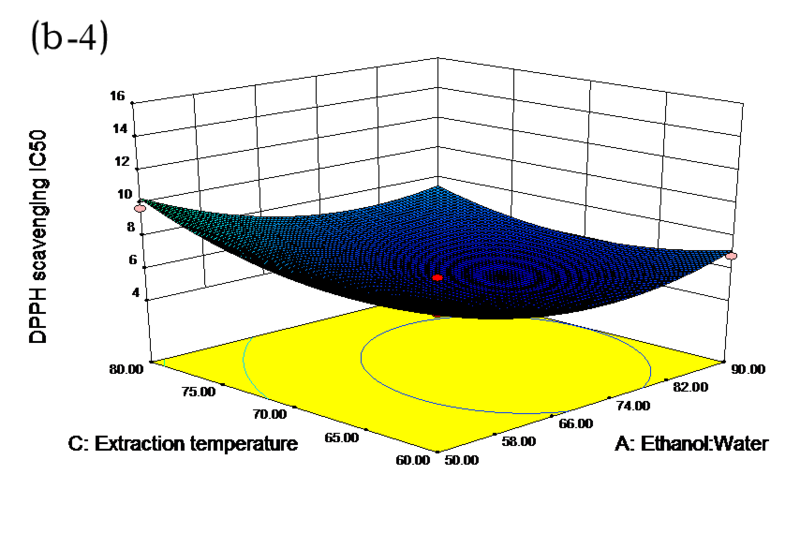 "Optimization protocol for the microwave-assisted extraction of antioxidant components from Pinus elliottii needles using response surface methodology," BioRes. 12(1), 478-494. 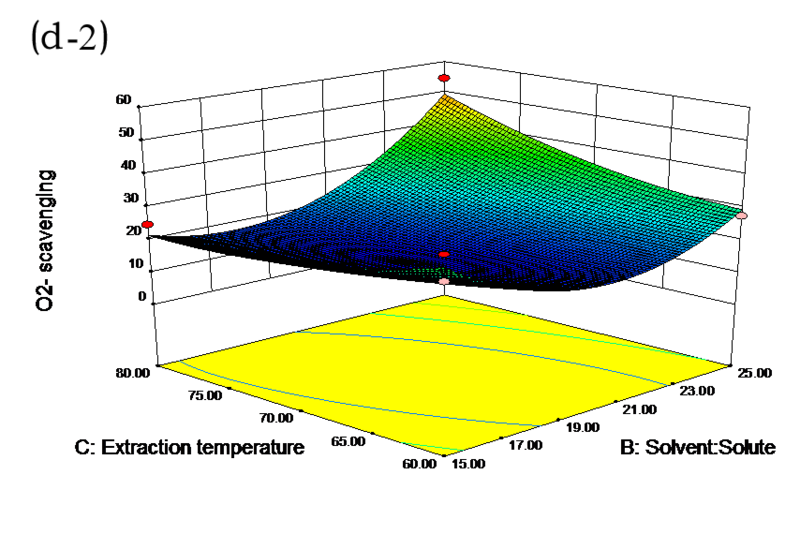 Response surface methodology (RSM) based on a Box–Behnken rotatable design was used to determine the optimum conditions for the microwave-assisted extraction of antioxidant compounds from Pinus elliottii needles. 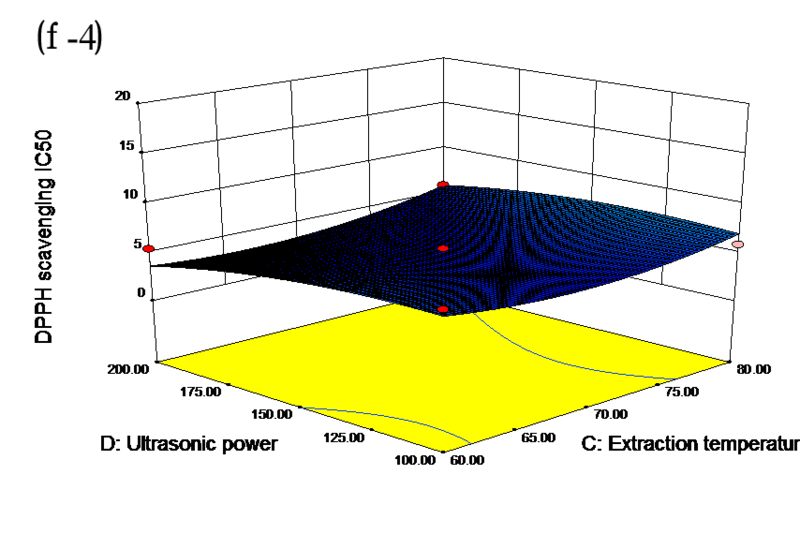 Four process variables were evaluated at three levels (29 experimental conditions): ethanol (50, 70, and 90%), solvent:solute ratio (25:1, 20:1, and 15:1), extraction temperature (60, 70, and 80 °C), and ultrasonic power (100, 150, and 200 W). Using RSM, a quadratic polynomial equation was obtained by multiple regression analysis to predict the optimized extraction protocol. The radical scavenging capacity was determined by O2−, ·OH, and DPPH methods. 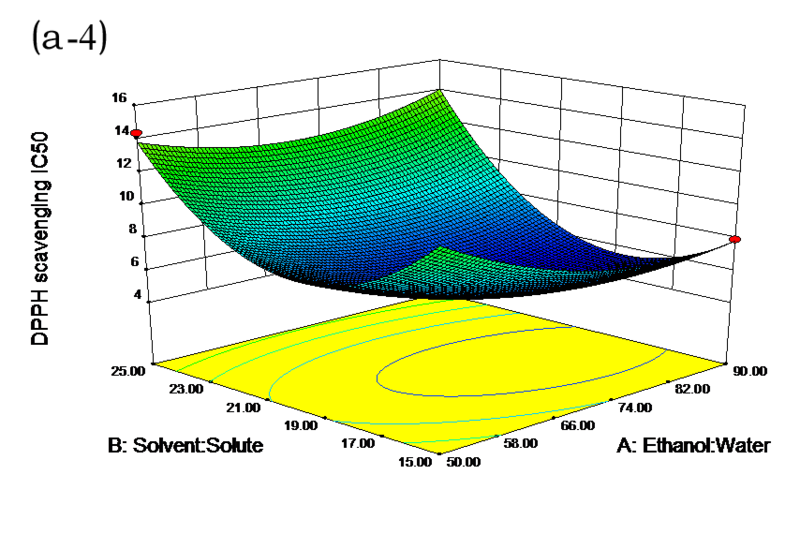 For the microwave-assisted extraction of antioxidant compounds from Pinus elliottii needles, the optimum process used ethanol at 72%, a solvent:solute ratio of 21:1 mL/g, an extraction temperature of 67 °C, and an ultrasonic power of 200 W. The results indicated good correlation between total polyphenols content and O2−, ·OH, and DPPH radical scavenging activities. Pine is widely utilized in Chinese drinks and herbal medicine and is recommended in Ayurvedic medicine for treating rheumatism, diabetes, obesity, gonorrhea, chronic bronchitis, cancer, and stomach and cardiovascular diseases (Kim and Chung 2000; Singh et al. 2011, 2015; Zeng et al. 2011, 2012b; Zhang et al. 2015, 2016). Pine needles is a recognized health food material and is widely used as a flavoring agent in foods and beverages (Kim and Chung 2000; Ratola et al. 2010; Zeng et al. 2012a; van Drooge et al. 2014; Mahajan et al. 2016). The biological properties of pine needle extracts have been the subject of recent interest in academia and food industries because of their potential as antioxidants and radical scavengers (Zeng et al. 2011, 2012a, 2012b). Pinus elliottii, commonly called slash pine, is native to the Southeastern USA (Caetano da Silva et al. 2014; Chaudhary et al. 2014; Parker et al. 2014; Susaeta et al. 2014; Zhai et al. 2015; Nunes et al. 2016). It is common throughout the southeastern United States, Taiwan, and South China (Chaudhary et al. 2014). The Pinus elliottii plant has a long history of traditional and ethnobotanical applications in diverse cultures (Chaudhary et al. 2014; Nunes et al. 2016). 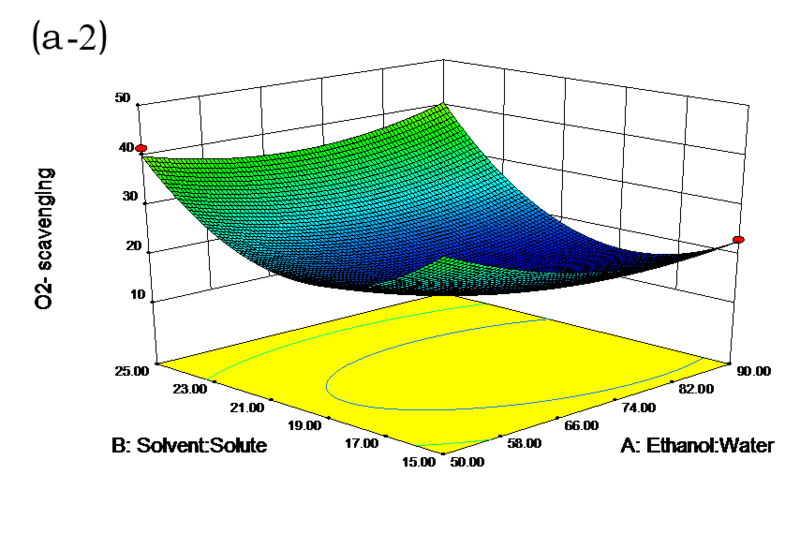 Microwave-assisted extraction has been successfully used in recent years for the extraction of functional components from different plant matrices. By the use of ultrasonic mechanical crushing and cavitation, as an alternative to traditional extraction procedures, one can considerably reduce not only the extraction time, but also solvent consumption and energy requirements. Importantly, it also has been shown to result in high extraction efficiency compared to conventional techniques (Xu et al. 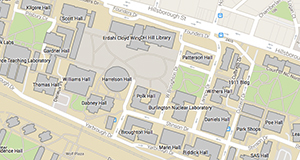 2015a,2015b; Pinela et al. 2016). Antioxidant activity can be measured indirectly on the basis of its effects on model systems. Most methods are based on a radical generating system (Valavanidis et al. 2004; Zhang et al. 2014; Xu et al. 2015a,2015b; Chen et al. 2016; Rashidinejad et al. 2016; Santos et al. 2016). Radical-based methods such as superoxide anion radical scavenging activity (O2−), hydroxy radical scavenging activity (·OH), and 1,1-diphenyl-2-picrylhydrazyl scavenging activity (DPPH) assays have been proposed to evaluate the antioxidant capacity of green tea (Zhao et al. 2008; Balabani et al. 2011; Mandawad et al. 2013; Anissi et al. 2014; Zhu et al. 2015; Gramza-Michałowska et al. 2016). 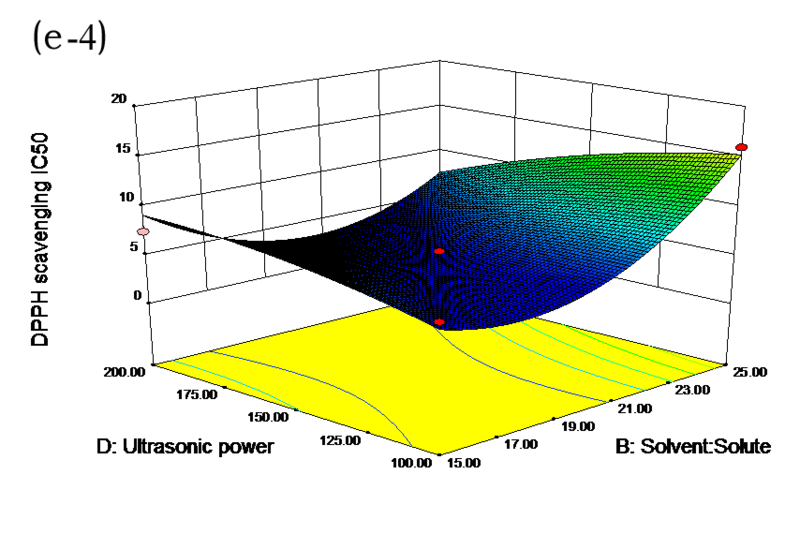 Response surface methodology (RSM) is a mathematical and statistical technique that is used to study and optimize multivariable systems by finding the true relationship between the response and the set of independent variables. 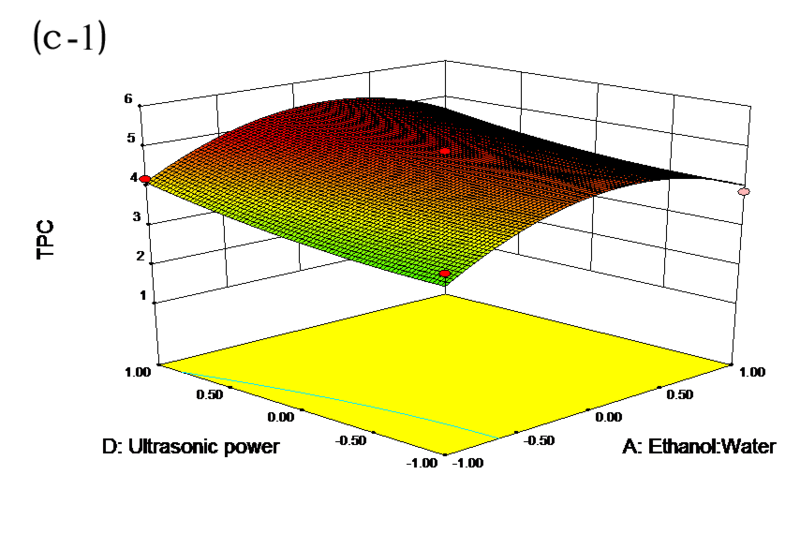 The optimization of analytical procedures has been carried out by using multivariate statistic techniques to simultaneously optimize the levels of these variables to attain the best system performance. To date, the scavenging activities of polyphenols from Pinus elliottii needles against superoxide anion radicals, hydroxy radicals, and DPPH radicals have not been determined. Therefore, the objectives of this study were to optimize the conditions (ethanol/water ratio, solvent/solute ratio, extraction temperature, and ultrasonic power) for the extraction of antioxidant compounds from Pinus elliottii needles, to determine the total polyphenols content, and to determine the active composition of polyphenols in Pinus elliottii needles. 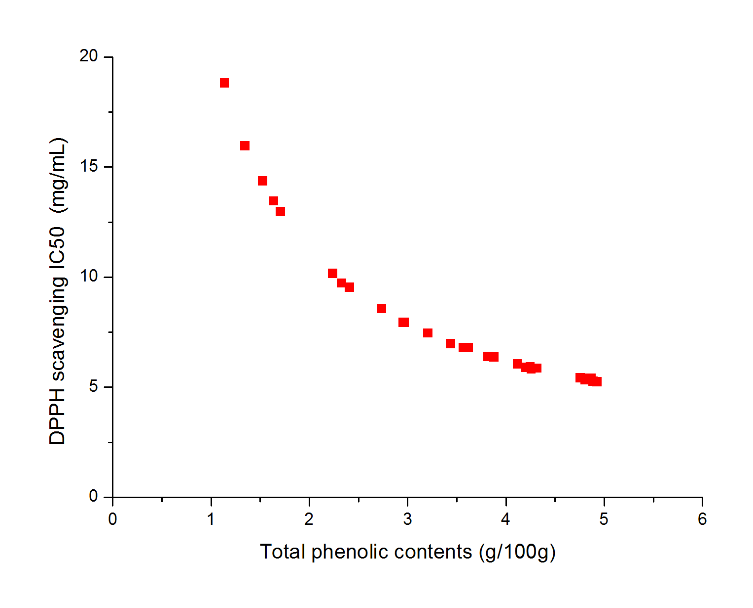 The polyphenols composition and antioxidant capacity were related in an attempt to establish a correlation between the total polyphenols content and the total antioxidant activity. Pinus elliottii needles were collected from Miluo, Yueyang, Hunan Province, China, in 2015. Samples were collected, washed, dried in a hot air oven at 50 to 60 °C, and converted to powder in a grinder. These samples were stored in airtight polythene bags at 4 °C for the extraction process. DPPH, gallic acid, and Folin-Ciocalteu reagent were obtained from Sinopharm Chemical Company (Beijing, China). All other chemicals and solvents used were of analytical grade from Hunan Chemical Reagent Factory (Changsha, China) and were used as received or dried by standard procedures, unless stated otherwise. A protocol for the extraction of antioxidant components from Pinus elliottii needles was established by response surface methodology (RSM), which was employed to determine the best combination of variables for the optimum extraction yield and antioxidant activity. 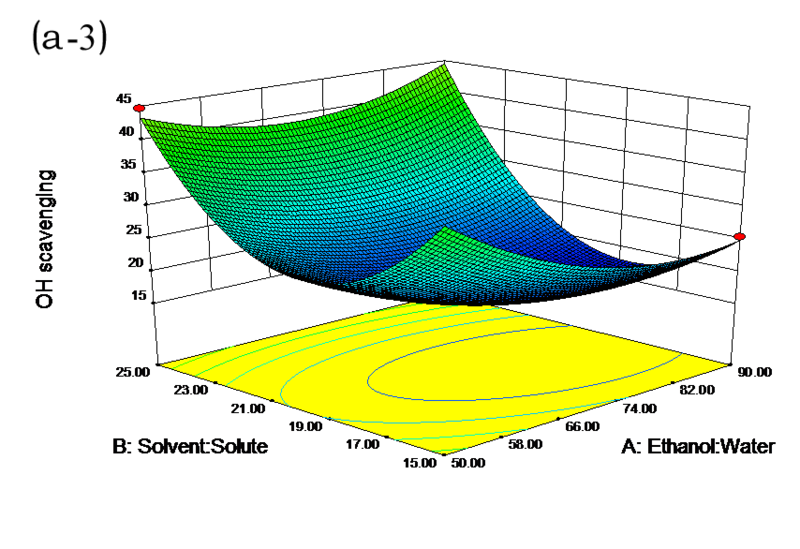 RSM was used to analyze the influence of four extraction process variables on the yield of antioxidant components: ethanol/water ratio, solvent/solute ratio, extraction temperature, and ultrasonic power. Protocol requirements were considered when choosing the factorial levels. According to previous work (Xu et al. 2015b; Pinela et al. 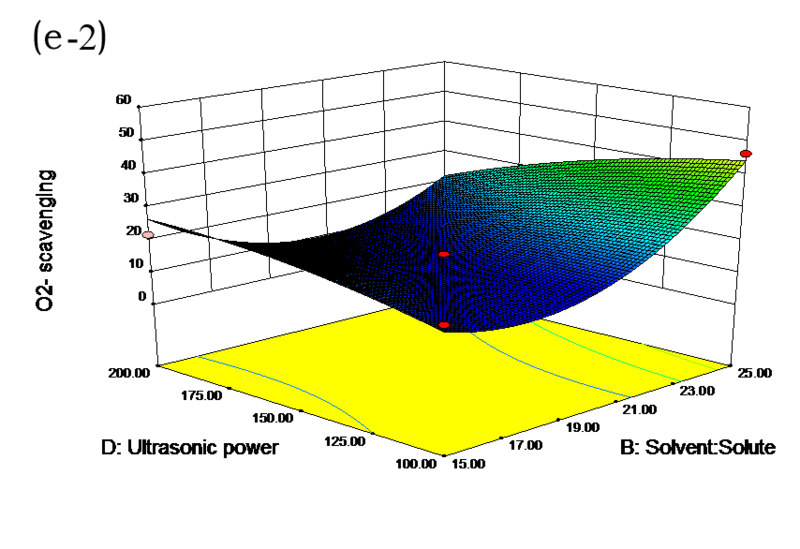 2016), the ethanol/water ratio, solvent/solute ratio, extraction temperature, and ultrasonic power were varied in the ranges 90:10, 70:30, 50:50; 25:1, 20:1, and 15:1 (mL:g); 60, 70, and 80 °C; 100, 150, and 200 W, and extraction time 60 min, respectively. The response variable used to build the model corresponded to the yield of antioxidant components obtained in each experiment. The regression equation and analysis of variance (ANOVA) were obtained using Design Expert 8.0.6 software (Stat-Ease Inc., Minneapolis, USA). ANOVA was used to summarize the results obtained under all the experimental conditions. A confidence interval of 95% was set to test the significance of the factors and their interaction. The F statistic test was used to evaluate whether the regression model was adequate to describe the observed data. The variability of the optimization parameter was analyzed by R2 statistics. 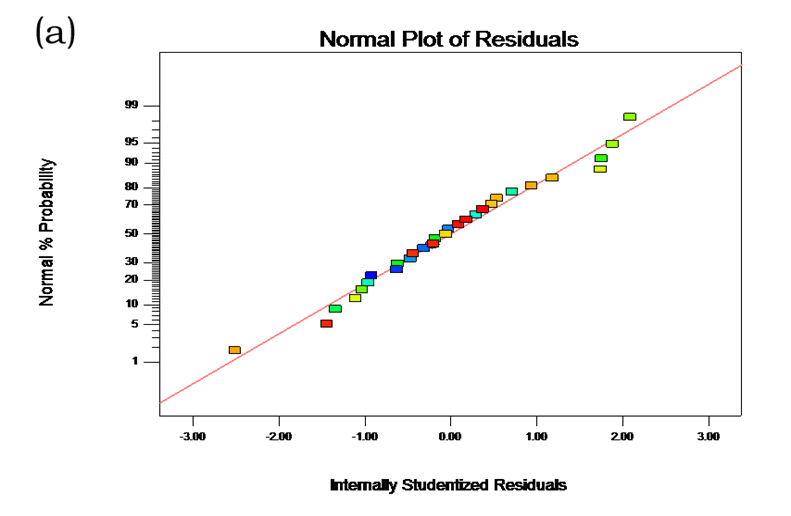 In addition, the normal probability plots of the residuals and the plots of the residuals versus the predicted response were utilized to evaluate the adequacy of the model. Antioxidant extracts were prepared using an orbital shaker and all of the combinations suggested by RSM. Ground samples in 500 mL conical flasks were suspended in solvent, and the flasks were placed on an orbital shaker for the optimum time. The extracts were separated from solids by filtration (Whatman No. 1) and concentrated under reduced pressure using a rotary evaporator. 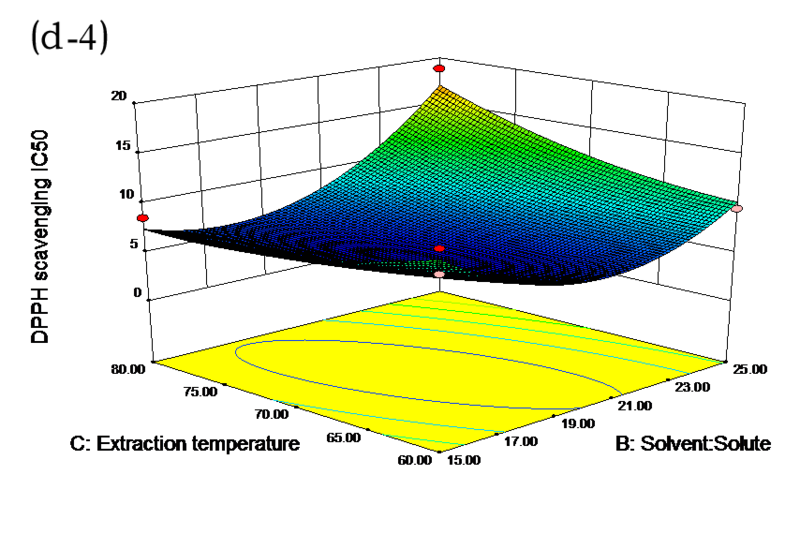 Viscous extracts were stored at 4 °C until testing and analysis (Hussain et al. 2012; Monroy et al. 2016). Following the method reported earlier (Hussain et al. 2012), TPCs from all isolated extracts were assessed using the Folin-Ciocalteu reagent with spectrophotometric determination. Crude extract (50 mg) was mixed with 7.5 mL of Milli-Q-water and 0.5 mL of Folin-Ciocalteu phenol reagent. The mixture was kept at room temperature for 10 min before 1.5 mL of 20% (w/v) sodium carbonate solution was added. The mixture was heated in a water bath at 40 °C for 20 min and then cooled in an ice bath. 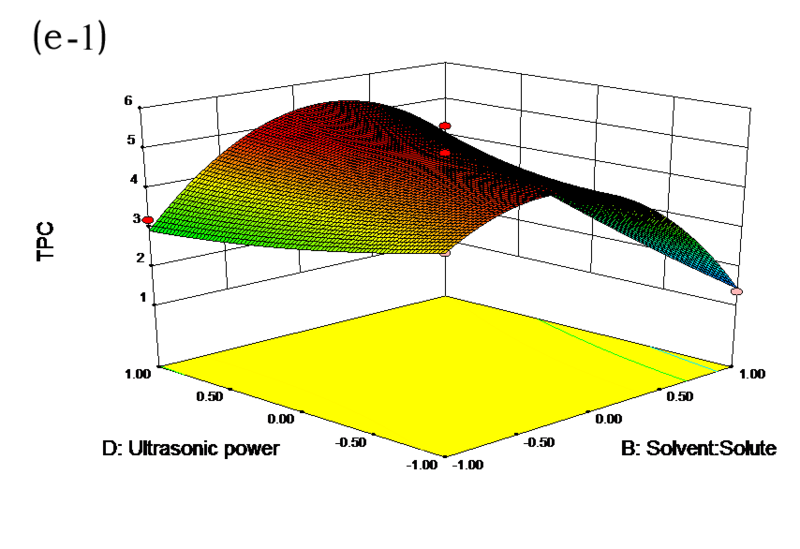 The absorbance was measured at 755 nm using a UV-Visible spectrophotometer (Bio Tek Instrument, Winooski, VT, USA). A standard curve based on gallic acid was used for the conversion of absorbance to polyphenols concentration in gallic acid equivalents. 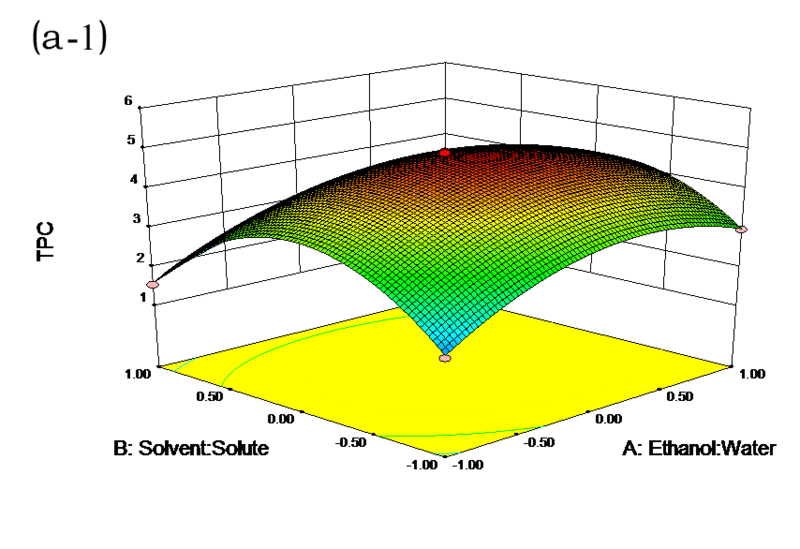 where Sblank is the peak area of the DMPO–O2− solution and Ssample is the peak area of the extract solution. The extract concentration that provided 50% scavenging (IC50) was calculated from the plot of inhibition percentage against extract concentration. Hydroxy radical (·OH) scavenging activity was analyzed in the same way as superoxide anion radical scavenging activity, which used the DMPO spin adduct generated by the Fenton reaction (Nakai et al. 2003). 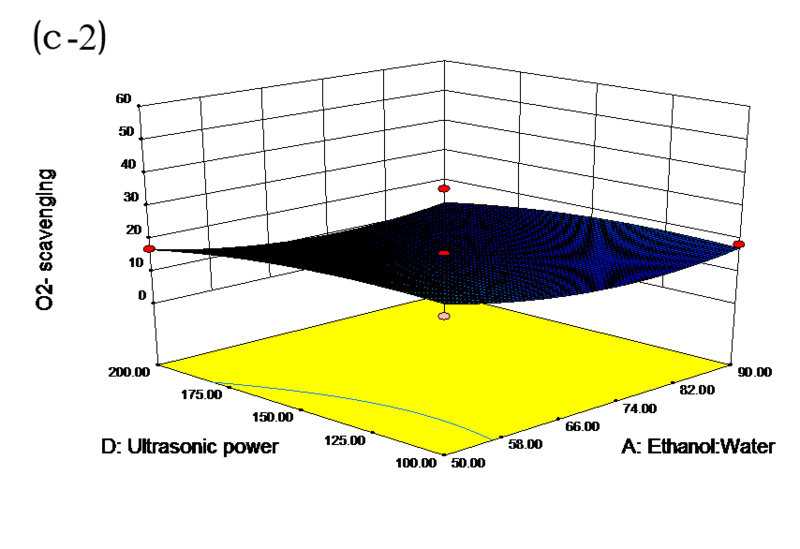 The absolute concentration of DMPO–·OH was determined by the double integration of the ESR spectrum. Ethanol (100%) was the blank. The percent scavenging was calculated according to Eq. 1, where Sblank is the peak area of the DMPO–·OH solution. IC50 against the hydroxyl radical was calculated from the plot of inhibition percentage against extract concentration. The sampling procedure used a 100 mM sodium phosphate buffer solution (pH 7.4) as the solvent. 75 μL of 200 μM FeSO4 and 200 μM DTPA solution, 50 μL of sample solution, and 20 μL of 0.879 M DMPO were added to a test tube. A 20 μL aliquot of 10 mM H2O2 was added to the tube and the mixture was stirred for 10 s before being transferred to the flat cell. The ESR spectrum was recorded with acquisition starting 60 s after the addition of H2O2, where Sblank is the peak area of the DMPO–·OH solution. 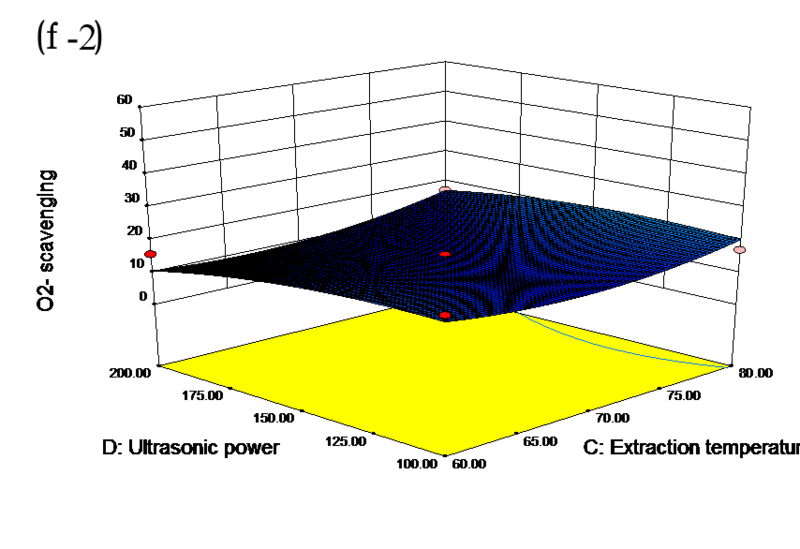 ESR analyzed DPPH scavenging activity with a recording rate of 5 mT/min. After recording, the signal intensity of the lowest field peak was normalized as the relative height against the standard signal intensity of the manganese oxide marker. 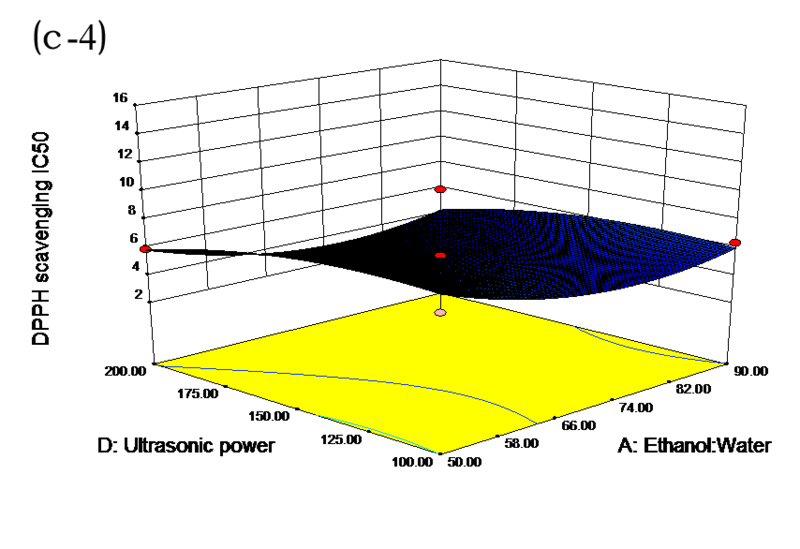 The absolute concentration of DPPH was finally determined by the double integration of the ESR spectrum. Ethanol (100%) was used as the blank. The percent scavenging was calculated according to Eq. 1, where Sblank was the peak area of the DPPH solution. IC50 against the hydroxyl radical was calculated from the plot of inhibition percentage against extract concentration. A total of 100 μL of 60 μM DPPH in 50% CH3CN and 100 μL of the sample in 50% CH3CN were added to a test tube. After stirring for 10 s, the reaction mixture was added to the flat cell. 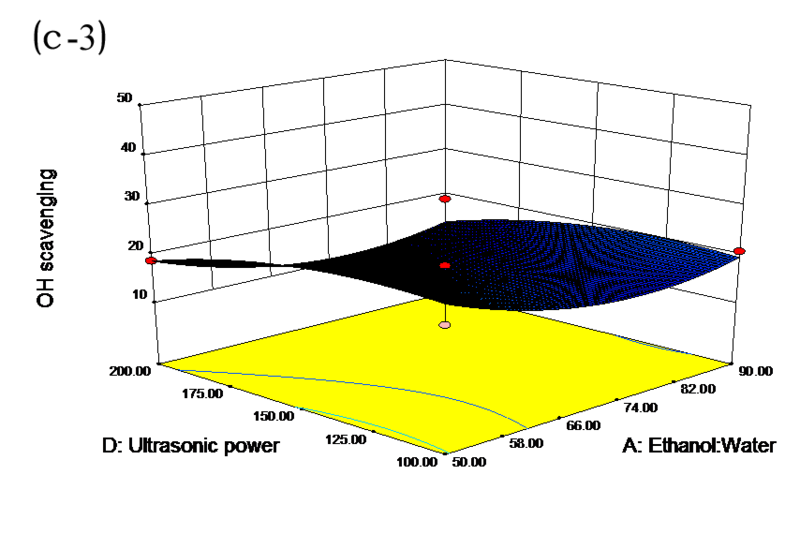 ESR spectrum recording began 60 s after the addition of DPPH, with a recording rate of 5 mT/min. Afterward, the signal intensity of the lowest field peak was normalized as the relative height against the standard signal intensity of the manganese oxide marker. Ethanol (100%) was used as the blank. 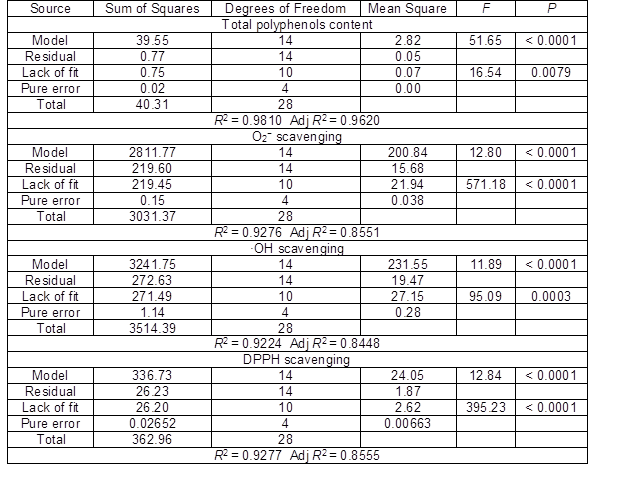 The percent scavenging was calculated according to Eq. 1. The IC50 value was calculated as described above. 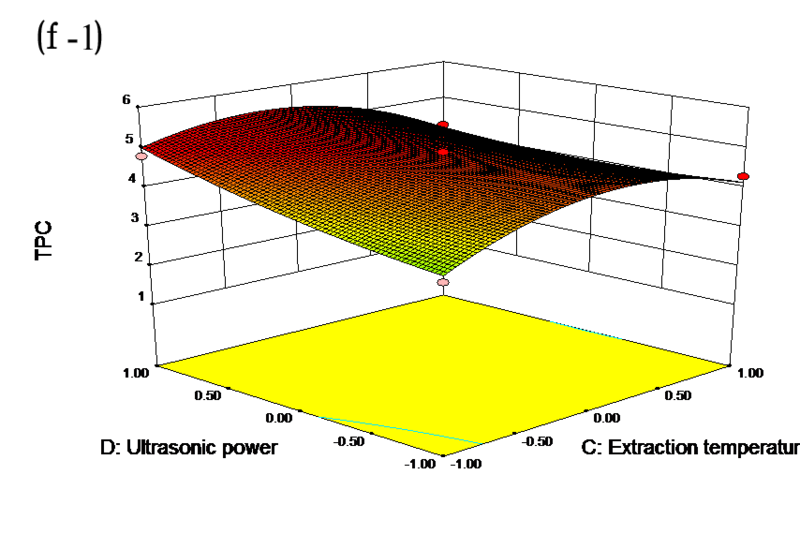 Extraction conditions for Pinus elliottii needles were analyzed individually in triplicate. 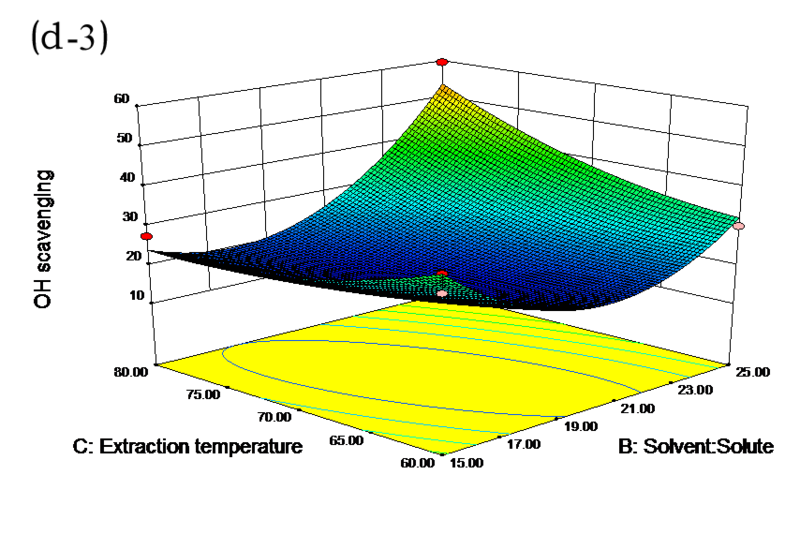 RSM was employed with a Box-Behnken rotatable design to investigate the effect of different solvent concentrations, solvent/solute ratio, temperature of extraction, and ultrasonic power. 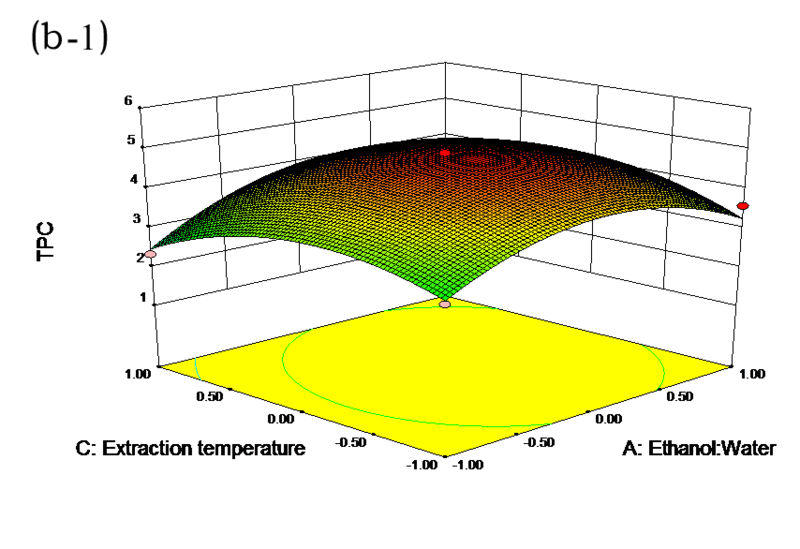 The experimental plan was designed and the results obtained were analyzed using Design Expert 8.0.6 software (Stat-Ease Inc., Minneapolis, USA). 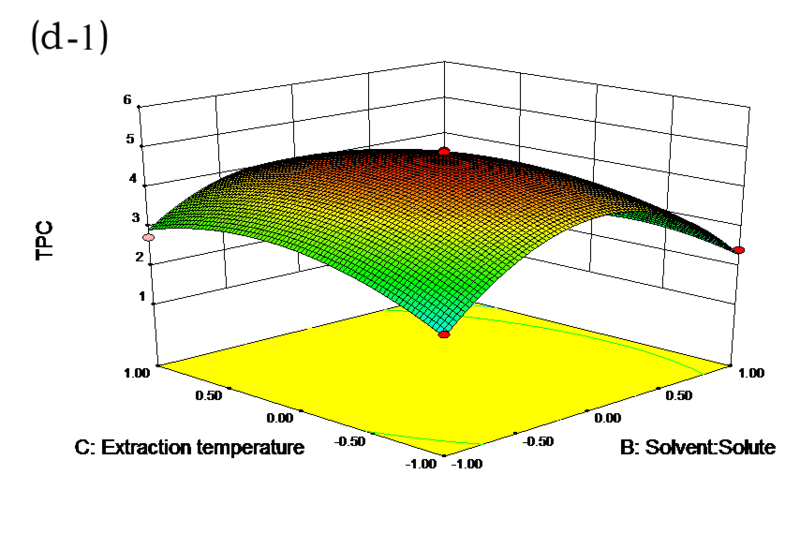 This was done to build and evaluate models and plot contours and three-dimensional (3D) response surface curves. In this study, four operational variables (solvent concentrations, solvent/solute ratio, temperature of extraction, and ultrasonic power) were optimized for maximum antioxidant extract yield, i.e. 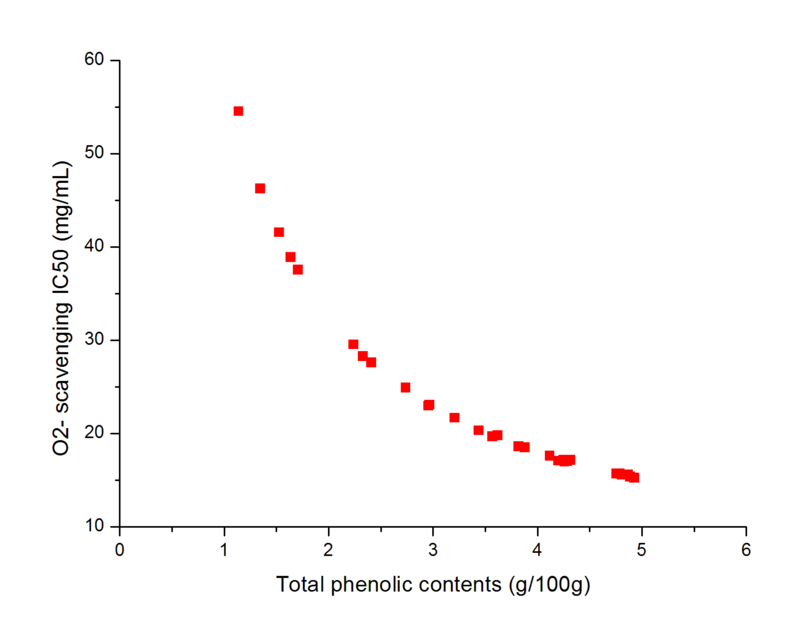 total phenolics content (TPC) by using RSM. Table 1 shows the template of the Box-Behnken rotatable design. Initially, influential factors including solvent concentration, particle size, liquid/solid ratio, and extraction time were investigated separately to determine the extraction yield. 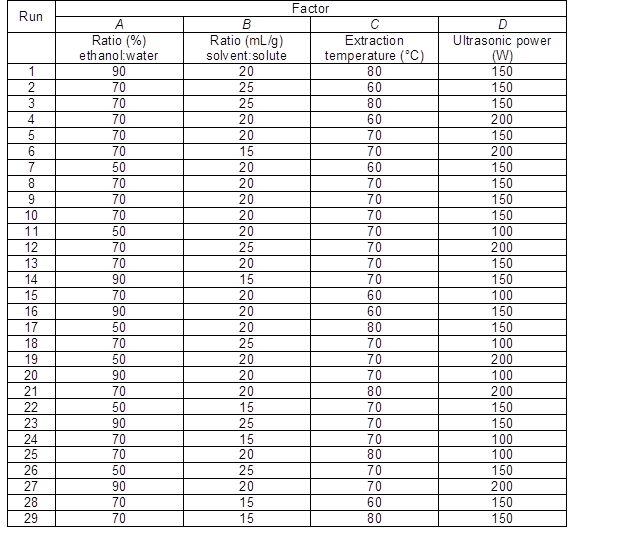 Table 2 shows the experimental and predicted data in terms of TPC and radical scavenging capacity. By using RSM, the TPC ranged from 1.14 to 4.93 g/100 g (Table 2). Normal probability plots of the residuals and the plots of the residuals versus fitted values were used for the adequacy of the model (Fig. 1a and b). 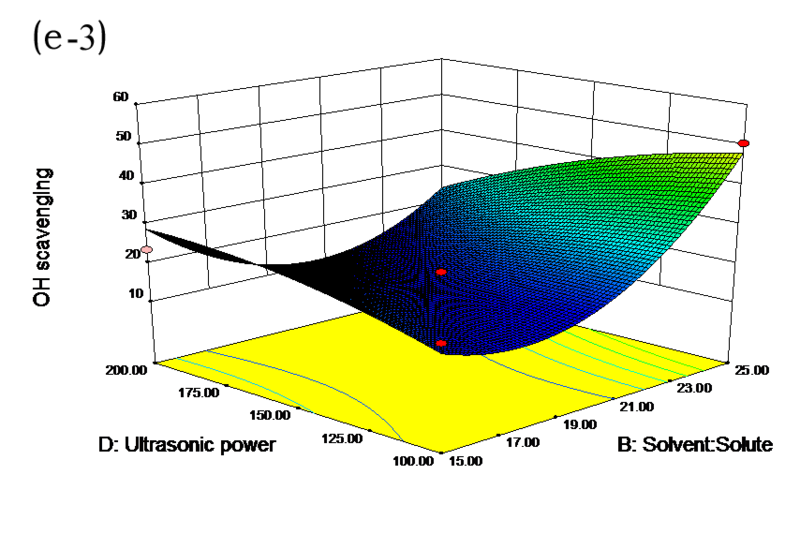 The maximum TPC was obtained at ethanol concentration of 72%, solvent:solute ratio of 21:1, extraction temperature of 67 °C, and ultrasonic power of 200 W.
Among the 29 runs (Table 2), run 9 produced the highest total polyphenols content (4.93 g/100 g) and run 3 produced the lowest (1.14 g/100 g). For O2−, ·OH, and DPPH, runs 9 and 13 both produced the highest radical scavenging capacity IC50 (15.20 mg/mL TPC for O2−, 16.47 mg/mL TPC for ·OH, and 5.23 mg/mL TPC for DPPH). Run 3 for O2−, ·OH, and DPPH produced the lowest radical scavenging IC50 (54.52 mg/mL TPC for O2−, 59.47 mg/mL TPC for ·OH, and 18.80 mg/mL TPC for DPPH). Fitting the data with various models, ANOVA showed that the TPC and radical scavenging capacity could be described using quadratic polynomial models. 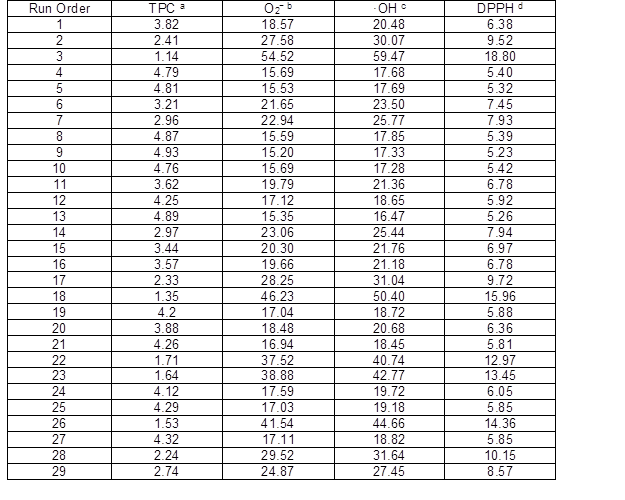 A large F-value implied that the models were significant at a 95% confidence level (Table 3). All models were highly significant because the “Prob > F” relation was less than 0.0001. The lack-of-fit p value was larger than 0.05; it was not significant relative to the pure error. Furthermore, the low values of pure error indicated good reproducibility of the data. 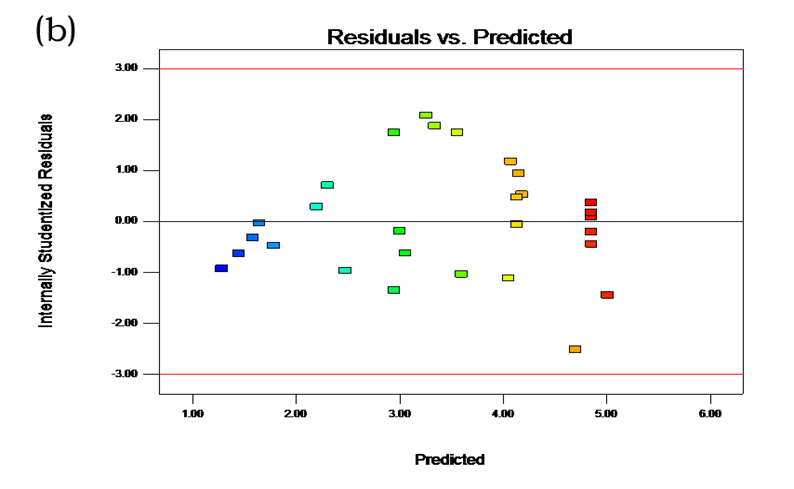 “R2” and “Adj R2” also revealed excellent correlations between the independent variables. Table 4 demonstrates the relationship between independent variables, target content, and radical scavenging capacity in second-order polynomial models. The effects of independent factors and their interactions on TPC, O2− IC50 value, ·OH IC50 value, and DPPH IC50 value were calculated by response surface plots. Figure 2 shows the response surfaces for the interactions of independent variables on the extraction efficiency of TPC (a-1, b-1, c-1, d-1, e-1, and f-1), O2− scavenging activity (a-2, b-2, c-2, d-2, e-2, and f-2), ·OH scavenging activity (a-3, b-3, c-3, d-3, e-3, and f-3), and DPPH scavenging activity (a-4, b-4, c-4, d-4, e-4, and f-4). The main activity was attributed to curcuminoids because the TPC was positively associated with radical scavenging capacity (Fig. 3), but the effects of other bioactive compounds could not be excluded. 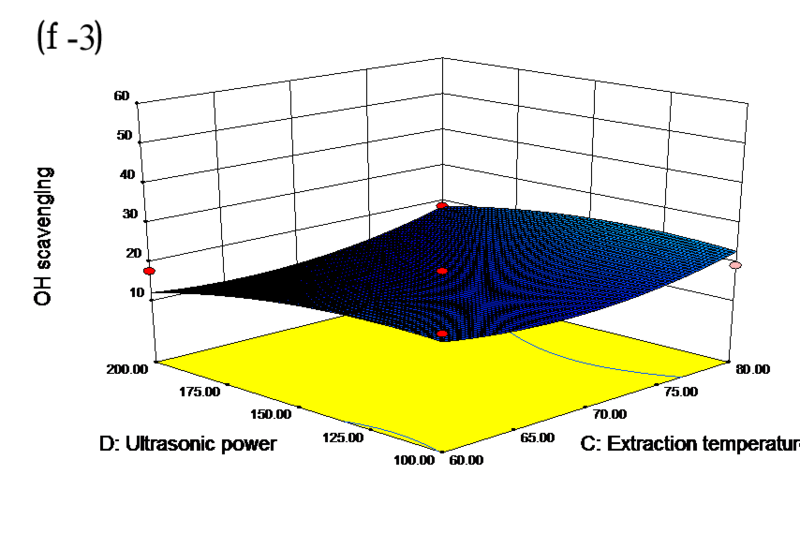 The optimum microwave-assisted extraction conditions for the response variables from TPC obtained by RSM are presented in Table 5. The verification tests were conducted under the optimum conditions (an ethanol:water ratio of 72:28, a solvent:solute ratio of 21:1, an extraction temperature of 67 °C, and an ultrasonic power of 200 W). The actual extraction efficiency was 5.11 g/100 g TPC, with IC50 values of 54.52 mg/mL for O2−, 59.47 mg/mL for ·OH, and 18.80 mg/mL for DPPH. Under these conditions, the highest TPC and radical scavenging capacity were obtained. These experimental results matched the predicted results, which indicated the polynomial models gave good correlations. A second-order polynomial model gave a satisfactory description of the experimental data. A set of optimized conditions for the maximum extraction of antioxidant extracts was determined. 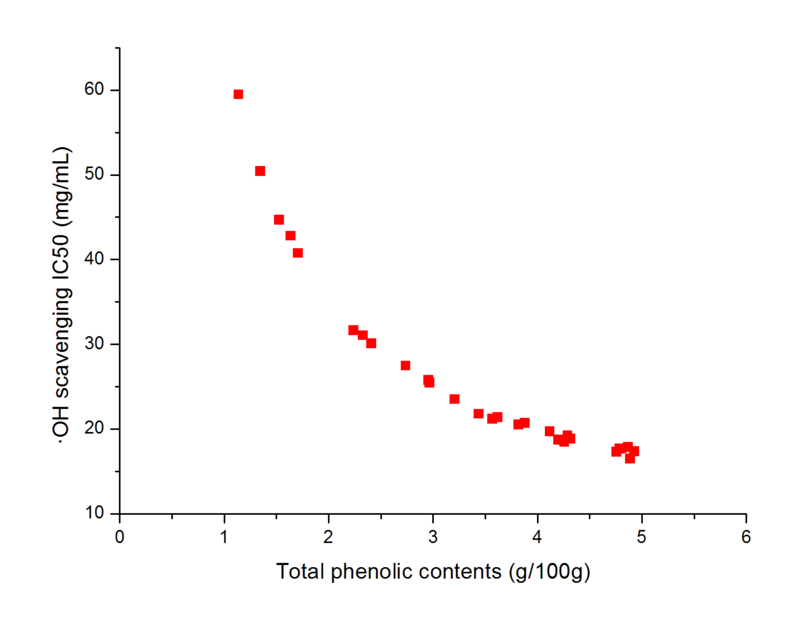 The results indicated good correlation between total polyphenols content and O2−, ·OH, and DPPH radical scavenging activities. The results of this study should prove useful in the development of the industrial extraction processes, including further studies to establish the optimal number of steps in large-scale extraction systems. This project was supported by the National Natural Science Foundation of China (Project No. 31560192; Youth Science Funds, Project No. 31100421), the Natural Science Foundation of Hunan Province (Project No. 13JJB011), and the Science and Technology Project of the Key Laboratory for Ecotourism of Hunan Province (Project No. JSSTLY1516). Hussain, A. I., Chatha, S. A., Noor, S., Khan, Z. A., Arshad, M. U., Rathore, H. A., and Sattar, M. Z. (2012). “Effect of extraction techniques and solvent systems on the extraction of antioxidant components from peanut (Arachis hypogaea L.) hulls,” Food Analytical Methods 5(4), 890-896. Kim, K.-Y., and Chung, H.-J. (2000). “Flavor compounds of pine sprout tea and pine needle tea,” Journal of Agricultural and Food Chemistry 48(4), 1269-1272. Singh, L. K., Chaudhary, G., Majumder, C., and Ghosh, S. (2011). “Utilization of hemicellulosic fraction of lignocellulosic biomaterial for bioethanol production,” Advances in Applied Science Research 2(5), 508-521. Singh, P., Tripathi, K., Yadav, R., and Yadav, K. (2015). “Devadaru (Cedrus deodara (Roxb.) Loud. ): A critical review on the medicinal plant,” International Journal of Ayurveda and Pharma Research 2(1), 1-10. Article submitted: August 1, 2016; Peer review completed: October 2, 2016; Revised version received and accepted: November 14, 2016; Published: November 22, 2016.